At 1:45, he explains what is inside bone marrow. In 60cc of fat, there are 150k MSCs, in 60cc of bone marrow, there are 50K MSCs. 2:50 explains his interest of studying immunology and cell biology. 7:30 Mesoblast company proved GVHD requires 14M MSCs to suppress. Hence he started on a quest to expand patient MSC to 7M cells. This yielded 60-80% improvement for COPD but after four treatments, they were refractory. 11:30 There is a dose-response relationship with allogeneic MSC cells. The more the better. Unfortunately, there is immune rejection. Unfortunately, the use of self-MSC in significant numbers takes time to produce and are not ready “off-the-shelf” for unexpected events, like burns or trauma. He mentions that MSCs are a “351 HCTP -human cell tissue product” meaning a biologic substance that are not FDA approved for human use in disease prevention and treatment. 15:00 Exosomes are in blood, urine, amniotic fluid, and milk. Cow milk causes us to express cow proteins. 15:35 DR uses an olive tree, olives, and olive oil as an extended metaphor for his production process. He notes that changing the growth conditions As for types of olives, he states he has 9 types of exosomes from different cell types. 16:35 The production process described: testing, extraction and expansion of MSCs under specific conditions, collecting the medium and then filtering after ultracentrifugation. The final product is tested for composition and to rule out infections before being released from quarantine. 19:40 What’s inside an exosome? Messenger RNA, microRNA, proteins. 20:25 Why is messenger RNA is more effective than protein therapy? Because of copy number and instability. mRNA can produce many copies of the protein. 21:30 Exosomes are taken up immediately. They are sterile, can be concentrated, are not rejected by the immune system (no HLA), can be frozen for up to 6 months. 22:45 Freezing is better than cryopreservation, which uses DMSO and causes sulfur reactions. 23:10 The medium (fluid surround cells that contain exosomes) is as effective as cells in treating a rat model of emphysema. 23:35 DR argues that cells may live for a week in a host, but that in a lab environment, the secretions can be continuously harvested without an end point. 25:20 Use of matrices in joint regeneration discussed. Fat, Platelet-rich plasm, platelet-rich fibrin matrix, and hylauronic acid. He states this provides “a structure for the cells to hold onto”. 25:50 2014 case of his friend’s severe facial burns healed with exosomes 3x/d for seven days. He argues the result was a direct result of the exosomes. 27:15 Injection of one knee can cause relief in both by reducing inflammation. 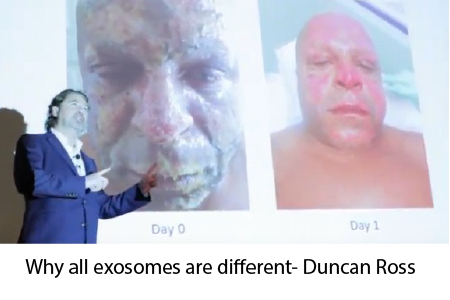 28:30 A deep dive into some of the specific protein contents of his MSCs exosomes. 29:15 DR proposes that combination of matrix, MSC exosomes, AND amniotic fluid-derived exosomes might be the most effective in joint regeneration because of the absence of pain conferred by amniotic-fluid derived epithelial-line exosomes. 30:40 DR argues that the methylation changes that occur are late onset and account for the “8-month later” effect in regenerative medicine. 33:10 Future directions: IND (investigation of facial nerve pain), custom exosomes. It is day 10 after intranasal and day after IV injection. I would say that my posture, muscle tone, sleep requirement, libido, and knee clicking are all improved. I also retain voluntary ASMR capability. And I believe I look younger as well as trimmer. If you are interested in learning more. please contact me to be put on a growing interest list. I am now fully stocked with the supplies needed to provide this service by a variety of routes, anywhere in the lower 48 states. I would like to be on your list for MSC Exosomes, thanks. Andy – You are now subscribed to my special list. There, I will share the good, the bad, and the ugly of what we are doing with regard to exosome therapy. So far, it’s all good but I’m waiting a bit longer to see how me and mom are doing.